Simple and sleek, the Maxwell Dining Chair White is a design that can be used in a number of locations, or around a variety of different styles of dining table. Brilliant and beautiful in design, the Maxwell has numerous features that offer a comfortable dining experience. White faux leather upholstering gives the chair a bright and fresh look, whilst generous padding enables optimum comfort when seated. An ergonomically designed high backrest lightly curves around the body for support whilst a stitched, vertical detailing provides a distinctive feature that can be seen from all angles. Meanwhile, four sturdy chrome legs complete the contemporary frame, and contain underside protective plugs to help in looking after your floors. Really pleased with these chairs, great value for money and stylish . Great service and prompt delivery. Love this chair. I have been looking for a stylish but comfortable chair for a guest bedroom and now I have it. Great value for money. Delivery was prompt and easy assembly. Good quality product and service. We were kept updated via prompt e-mails throughout and contacted by phone prior to delivery. The chairs look stylish and modern looking, they are made well, look strong, with easy assembly and very comfy. We had to return two chairs due to own order error. The returns were collected as arranged within 48 hrs and we were refunded promptly. We would use the compensation for other products in the future. I initially order 2 different chairs from Atlantic but didn't like them. So I called Atlantic to return them & ordered 6 white Maxwell chairs in place. Atlantic couldn't have been more helpful, polite, prompt & organised during the week that I made these calls. They talked to the warehouse to help me obtain the weight of the chairs (since I need to avoid very heavy chairs), ensure I used the right packaging (since we accidentally threw away the original big box) & delivered everything within the timeframe I needed. Excellent customer service! 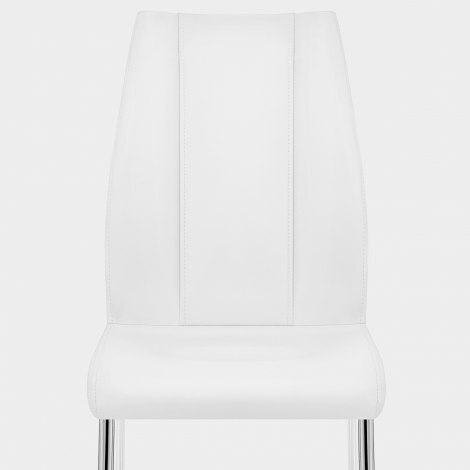 The white Maxwell chairs are just perfect - stylish, elegant, not to heavy, superbly made & at a great price. They look great around my solid oak table giving a contemporary look to a homely table. Am very pleased & would highly recommend!